#Win a prize from a wonderful John Lewis Christmas Hamper! I have to admit that I am an ardent John Lewis fan. Whether their high street departmental stores, online store, or, of course, Waitrose. Where I can, and have, spent many happy hours pushing my trolley up and down the aisles choosing from the wonderful array of the exotic and not so exotic. I even have their Mastercard which entitles me to lots of free gift tokens, according to how much I use it. Love them. 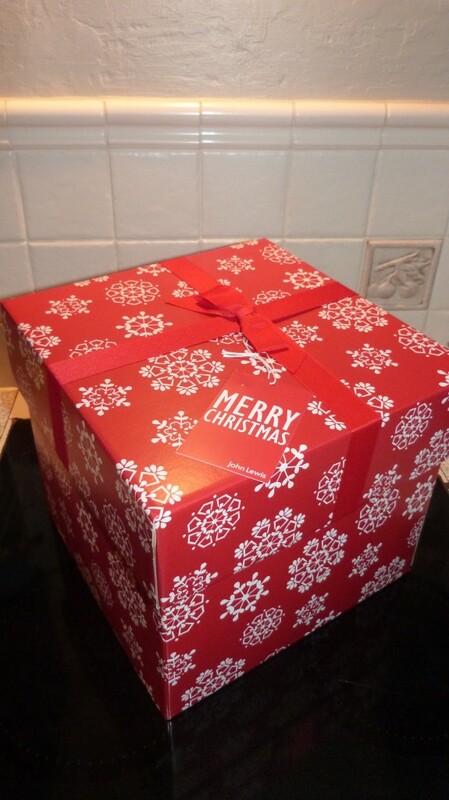 So you can imagine my glee when I was asked if I would like to review one of their scrumptious Christmas Hampers on my blog! I jumped at it and waited its arrival with trepidation. I missed the delivery because the courier came on practically the only day in the last six weeks I haven’t been at home. I was at the hospital for my ankle check up and, yippee, I don’t have to wear the orthopaedic boot any longer. It hurts to limp along but, hey, it’s not much to bear in the scheme of things. They said it would hurt and I will have to have physio sessions. Last time I slept upstairs in my bedroom for the first time for six weeks it as wonderful. Hope Alfie didn’t feel too lonely sleeping downstairs by himself! Yesterday the hamper arrived. It’s a Snowflake Christmas Hamper and is full of lovely goodies! I am no “bah humbug” and I would love to offer something from this hamper to you by way of a competition, but really don’t know what you would like to win. So please check out the contents at the link above and let me know what you would like. (Excluding the wine, because it might break in the post.) I will also throw in a £10 John Lewis voucher as well, to bump up the prize even more. All you have to do is leave your preferred prize as a comment here on my blog, including the link to the hamper, or leave a comment on my Facebook page, again quoting the link, or tweet me your preferred prize, with the link and #John Lewis. Then, when I know your favourite prize, I will write my review and launch the competition! Thanks Susan, I do hope I get some responses. I know it isn’t a lot, even though I’m chucking £10 of my own money at it, and the postage of course. Just think it would be nice to share some of it with somebody! Aha, I like to share Liz, as you may remember when I won all those cases of champagne at the ILPH anniversary ball. I put half of them back in the auction. Everybody said I was mad, except Jeremy, who said that it was a noble thing to do! Not really, am not blown away by champagne. Now red wine…..
Ah bless you Liz *blushes* Yes, er, it could have been better placed. (The case made over £500 for them – and it wasn’t very nice champagne. Still have a bottle I think!) Always easy to be wise in hindsight. It’s a very generous competition from you but I think you need to choose one thing yourself, as you will get such variety and often compers don’t mind, they just want to win something. I would stay away from the wine though as it brings into effect lots of complications about alcohol and ages. Thanks for this Missus BoyandMe, but don’t have to worry, as nobody, yes nobody, commented. Am at a loss. You did say that comments are really thin on the ground these days, but I thought for a competition I would get some. Nobody is RTing on Twitter either. Can’t understand it. Everybody has abandoned me! Really want to plug it as best I can, for John Lewis sake, more than mine really. So as nobody expressed a preference, I decided to give the choccies as they will be the lightest, and cheapest, things to post. I have a spare £10 voucher as I have a John Lewis mastercard so every now and again they send me complimentary gift vouchers, according to how much I have spent on the card! It’s always a lovely surprise and I spend ages deliberating what I will buy! Would be ever so grateful if you could please RT my review/comp tweet to all your zillions of followers. Will email Ali and ask her to RT it. Perhaps I can put out a tweet to @OrchardToys and hope that they would RT it. I only have about 130 followers so far. Once I’m more mobile I can start taking photos again, for your #365, silent Sunday, etc. Think I have one for Tara Cain’s gallery, which is nature, this Wednesday…… Ho hum. Lovely jubbly, thanks very much and the best of luck! What a lovely thing to do, I have just read through your other comments and posts and someone has retweeted for you as it popped up on my timeline!!!! I was going to say the chocolates as who can resist, so I’m glad you decided on those as the prize! Hello Lynn, how lovely, many thanks and good luck! Hello Claire, many thanks for your entry, tis much appreciated! Good luck! Hi Claire, many thanks for entering my competition – Lovely to see you here. Good luck!